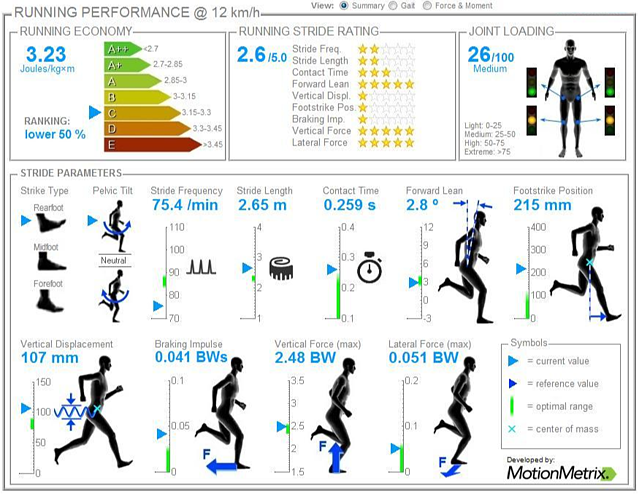 In this post, we will describe an example use case on how the MotionMetrix system, and its Running Economy (RE) rating, can be used to guide clients and patients to achieve more efficient overall running form and technique. For those reading this who are unfamiliar with the MotionMetrix system: MotionMetrix is a fully automated solution for analyzing runners. Through the use of depth sensing cameras, the system automatically captures data about a runner's stride, processes the collected information, and produces a 3 page report detailing Running Performance, Gait Characteristics, and Force and Moment Generation - all over the course of about 2 minutes. For more information on the process, please check out a post we published previously about the MotionMetrix process here. As we can see in the above example, this runner has achieved an RE value of 3.23 J/kg/m - this translate to a "C" rating - well below average performance. Some key characteristics that contribute to this runner's lower-than-average classification include a low stride frequency rating, as well as a footstrike position that is far in front of the center-of-mass. A low stride frequency rating tends to result in an increase in vertical displacement - as can be seen above. Additionally, the runner's footstrike position not only induces prolonged ground contact time, but also results in an increased braking impulse. All of these values contribute to a degraded RE. In order to counteract these hindrances on RE, the runner is instructed to increase stride frequency as a means of reducing vertical displacement - an effective strategy because these parameters show a strong (negative) linear dependance. In order to improve footstrike position, it is suggested that the runner "stand tall" to reduce the observed posterior pelvic tilt. Beyond the two previous recommendations, the runner is also instructed to relax the knee joint and allow the elastic bounce to accelerate the foot more upwards after toe-off in order to present less inertia in the forward swing motion of the same leg. After a few captures using the RE value as a steering parameter, the runner will be able to implement corrections properly an reach a significant improvement in RE. Through the use of fast feedback from the MotionMetrix system, it is easy for runners and coaches alike to be on the same page about what is occurring during a runner's stride. MotionMetrix serves as an effective and objective measure, in terms of identifying weaknesses in form and mechanics, as well as measuring and monitoring improvements made during coaching sessions. Since capturing and analyzing takes only minutes, the system makes it easy for coaches and clinicians to run through multiple captures during a session - reinforcing their recommendations and showing runners how slight corrections in their mechanics can lead to vast improvements in their economy. For more information about how the MotionMetrix system can add value to analyses performed at your clinic or running shop, send us an email! We have open slots in the coming weeks for real-time, online demonstrations of the system.